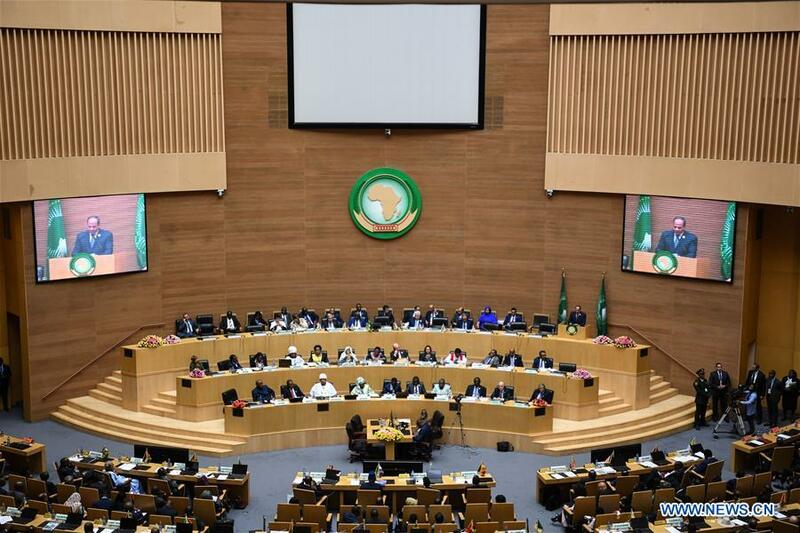 The 32nd African Union summit of heads of state kicked off on Sunday in Ethiopia's capital Addis Ababa, to primarily deliberate on pressing issues of the continent such as forced displacement as well as peace and security, among others. Under the main theme, "Refugees, Returnees and IDPs: Towards Durable Solutions to Forced displacement in Africa," the two-day session of the AU heads of state also deliberates on issues related to the ongoing AU institutional reform and continental free trade area among other continental projects and initiatives. In his opening remark, Chairperson of the African Union Commission, Moussa Faki Mahamat, said the issue of forced displacements in Africa remains sadly remarkable. "It is important to tackle more deeply the root causes of the phenomenon, in parallel with the acceleration of the operationalization of the African humanitarian agency," the Chairperson has noted. While lauding the positive developments in terms of peace and reconciliation in the East African sub-region, the Chairperson of the AU Commission has expressed concern over the existing situation at Sahel and Lake Chad Basin regions, urging enhanced solidarity to deal with the problem. "The fight against terrorism at Sahel and Lake Chad Basin continues to be a concern for us," he said, "Despite the remarkable efforts deployed by the countries in these regions, the situation remains very serious." On the other hand, Mahamat has hailed the progress on the ongoing institutional and financial reform of the Union, whereby he said steady progress is being made while accountability being improved. Speaking on his part, the UN Secretary-General, Antonio Guterres underlined the need to strengthen combined efforts on three major challenges, including, peace and security, sustainable development, and climate change. On peace and security, the UN Secretary General has hailed the positive changes in Africa, mentioning achievements such as the Ethiopia-Eritrea historic peace accord; the peace agreements by conflicting parties of Central African Republic (CAR); the South Sudan agreement, and peaceful elections in different parts of the continent among others. At the opening of the summit, Egyptian President Abdel-Fattah al-Sisi took over the rotating AU chairmanship from President Paul Kagame of Rwanda. Speaking on the occasion, Sisi called for efforts to promote peace and security as well as solidarity with refugees, migrants and internally displaced persons (IDPs). He has underlined the need to strengthen efforts in the fight against terrorism and religious extremism as well as in boosting infrastructure and urban development on the continent. Sisi has hailed the achievements of African countries in economic growth, social welfare and empowerment of women and young people. He also noted that AU would work in solidarity and partnership with the countries of the South and the North, and within the framework of tripartite cooperation to implement the 2030 Sustainable Development Goals (SDGs), which are in line with AU's priorities.